Two weeks of our „We’ll come United“ action days ended with a wonderful demo parade in Berlin. About fifty people from Wuppertal travelled to Berlin for the demonstration in a full coach on early Saturday morning. The people entering the bus represented the participants of the „We’ll come United“ parade in a small way: Half of the passengers were currently or formerly migrated to Wuppertal (or the surrounding area), the others are living in the region for a long time. They were men and women, families, elderly and young people. Given the current pressure caused by the deportations, it wasn’t very surprising that many people from Afghanistan were among the passengers. At the comUNITY-carnival in Berlin there also was a strong Afghan block formed behind a „Bleibistan“ -transparent. But there were people from many communities. So – the slogan „Everybody’s coming. From everywhere „, which was spread before the demonstration, was partly true. It was of course only partly correct, because not „everyone“ was there. This was primarily evident from the number of participants. Although the decentralized structure of the parade made it almost impossible to estimate the number of people present – there was never a central point where there was an overview at any time – the number of „about tenthousand“ people that was reportedly afterwards seems to be true. It was more like the upper limit, which may have been reached some time after the start of the parade on its way to the interim-rally at Lustgarten. The composition of these thenthousand also made it clear that the formerly plan of the campaign to reach a larger part of those who depict the millions of civic engagement for and with Refugees, did not work out. To a large extent, the „We’ll come United“ parade reminded us of a kind of „family celebration“ of migration-politically active people and anti-racist initiatives. Considered in this way, the figure of 10,000, which may be perceived as disappointing rather small, becomes a large one. At a relatively early stage it was clear that the goal to integrate civil society actors, who are often in a silent and voiceless political mood, into the „We’ll come United“ structures wouldn‘t work. Despite the participation of larger NGOs – i.e. attac Germany, various refugee councils, the Humanist Union or medico were among the co-signatories of the appeal – it was not possible to mobilize many people into a political manifestation, who are more and more confronted with consequences of the harsher asylum-laws or with increasing deportations within their framework of engagements in often small-scale „welcome initiatives“ of the cities and districts. In this respect, too, our efforts in the preparations of the local days of action were perhaps exemplary for the overall situation. The participants in the action days mostly depicted the spectrum of emancipatory and anti-racist groups in Wuppertal, which have been dealing with the topics for years. Exceptions are more likely to confirm the rule. It remains a phenomenon to be worked out why it’s still not possible to depict social conditions in the debates on refugees, flight and immigration, so-called integration or on the causes of searching refuge. To this day, the reasons for too many people not to adopt a political stance, as a result of their humanitarian commitment, when politics hinders and thwarts their humanitarian commitment, are still unclear. A review of this „juxtaposition“ must not be allowed to stand still in the face of criticism of those who were absent on September 16. Rather, we must also ask ourselves to what extent serious attempts have been made to show solidarity in supporting the humanitarian commitment with our political intervention since the summer of 2015. Much has certainly been missed. In view of the discourses, which have meanwhile been shifted far to the right, and shortly before an election, that enemies of an open society confirmed in their policies, the expectation to catch that up, could not be fulfilled. But even if it had been possible to mobilize tens of thousands of people on the streets of Berlin on 16 September, the question remains what it could have done to the recent executed policy of German and European isolation. The answer to this question is rather disillusioning in view of the even military determination to closing Europes borders. „We’ll come United“ would therefore have had an effect first and foremost on the inside: to get self-confidence and a renewed feeling of strength. This has been achieved with the demonstration parade from the Federal Ministry of the Interior to Oranienplatz with tenthousand participants. The unanimous assessment of all was that it was one of the „most beautiful“ demonstration of recent years. The participating people were beautiful. The many happy faces at the demo and at the roadside were beautiful. Especially the mass participation of refugees was beautiful. The audible polyphony was beautiful, even though it was not always possible to follow every speech due to the renunciation of a central rally. It was also beautiful that with the end of the parade, at Oranienplatz, a reference was made to the struggles of Refugees that took place before the „summer of migration“ in 2015 and which sometimes appear today as if they had taken place in another universe. Not only Napulis speech on the „O-Platz“ made it clear that this is not the case. Especially for those who have only recently become active, it became clear that refugee struggles are as constant as racism and ongoing repressions and discrimination. That was part of the merit of the demonstration. 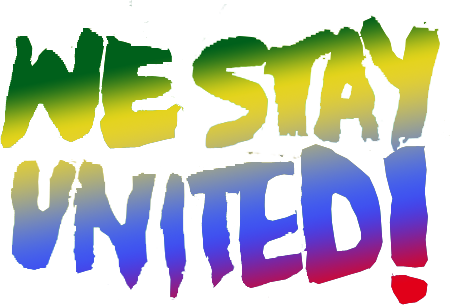 „We Stay United“, as the front-transparent said, was not only meant to be an announcement, but could also be read as a bridge between different „generations“ of refugees and supporters. Just as meritorious was the fact that it was clearly identified during the parade who is responsible for mass deaths in the Mediterranean, for a deportation machinery and for the constant tightening of asylum law. De Maiziére, Seehofer, Merkel, Gabriel, Steinmeier, Maas or Kretschmann are often far too well and unscathed in the face of public fixation on the AfD’s racist demands. Being able to name them openly perhaps only was possible because a very broad mobilization didn’t work out, so there were no disputes with groups who like to make differences in the condemnation of racist positions. 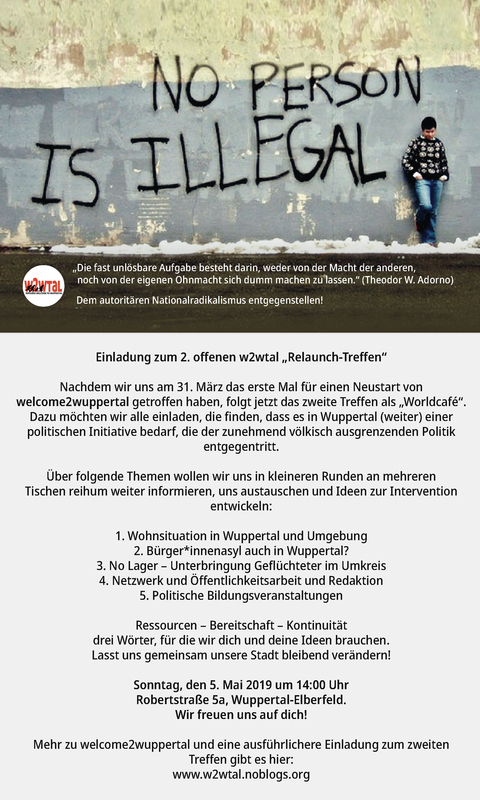 A similar effect could be recognized during our days of action in Wuppertal: The composition of the organizers made it possible to have very concentrated discussions on a number of topics that concern all those who are engaged for and with Refugees. We talked about growing Cultural Racism and Neonationalism, about the discourse in the media, which has also been shifted very far to the right, about anti-ziganism as a constant form of racism suitable for society‘s majority, about fundamental problems of engagement and about the increasing criminalisation of rescueing and supporting Refugees. The events were perceived as a success. We will gradually review the various activities and events of our action days and make individual contents accessible. The new cooperations won’t be broken off either. For both reasons, our website will therefore remain online and will continue to be updated.